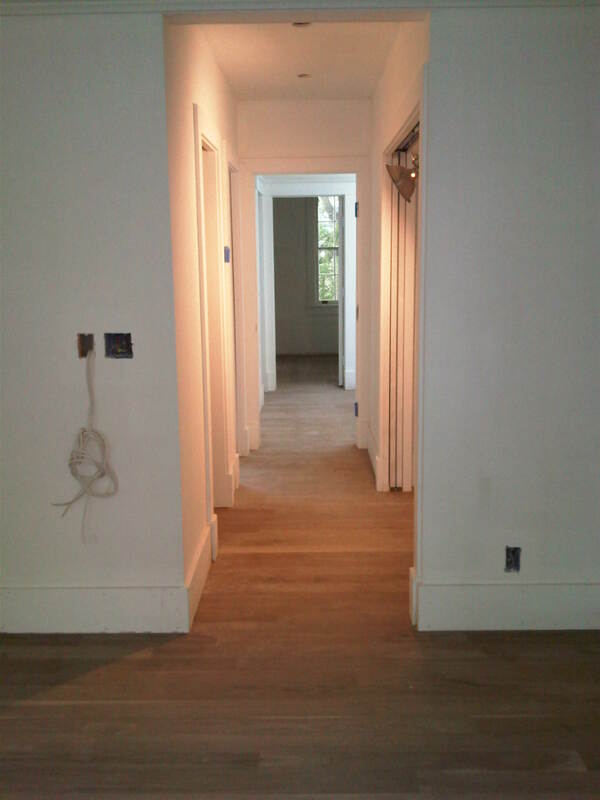 Generally speaking, the whole house renovation adventure has become a crazy container ship of stress, delivering anxiety to our lives each day in the form of uncertainty in decisions we need to make and a pernicious fear of regret in the decisions we have made. 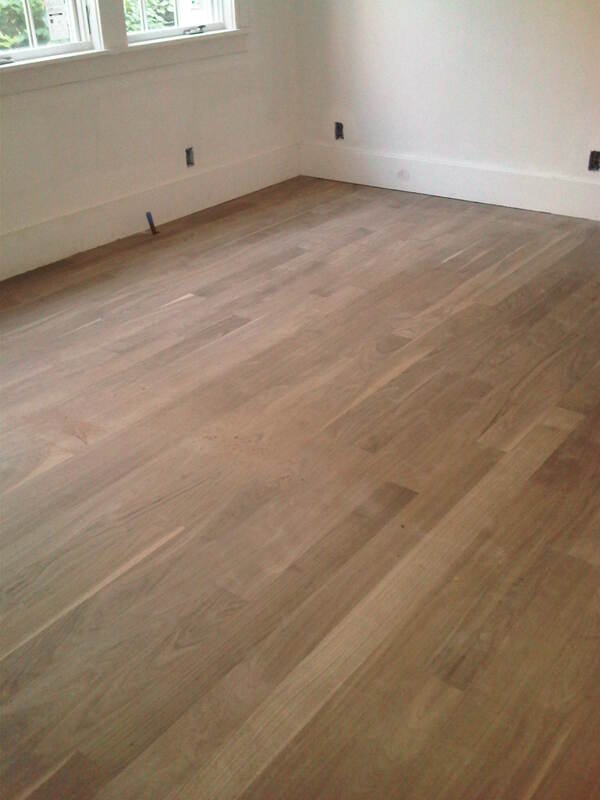 Every once in a while, though, we make progress on a component that restores our enthusiasm; a result that exceeds our expectations and literally makes our jaws drop. 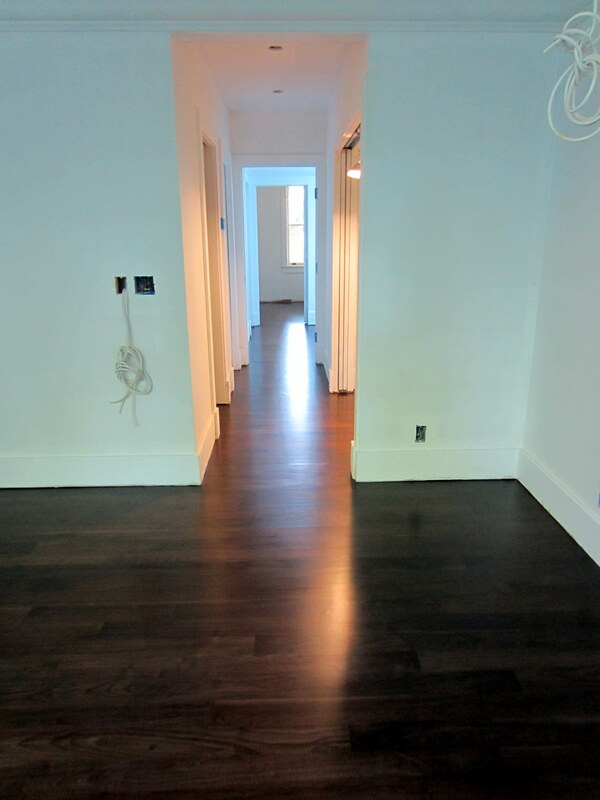 The finished hardwood floors have done precisely that. 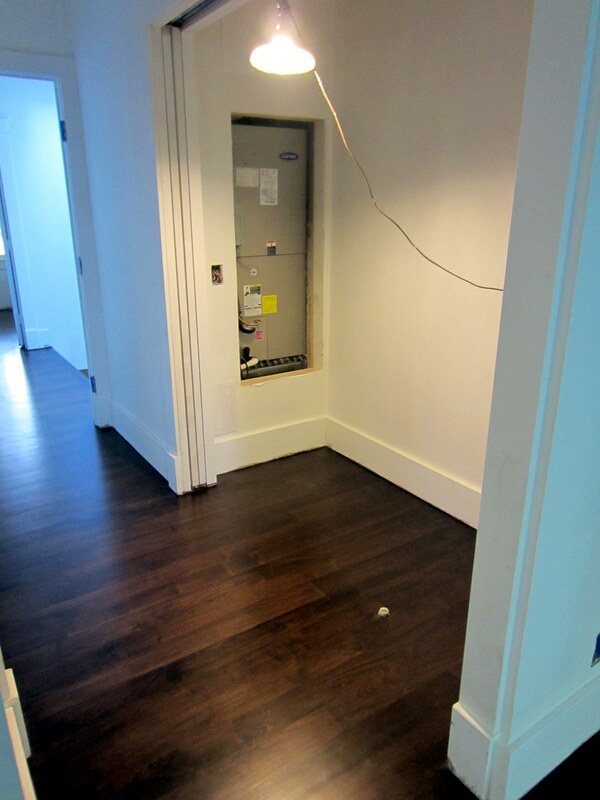 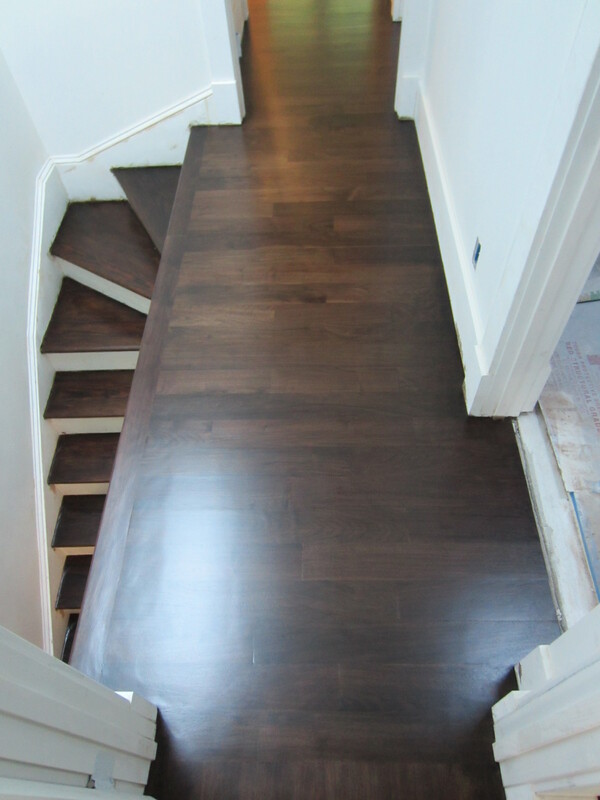 As part of the renovation, we removed the narrow white oak and heart pine flooring on the first and second floors, respectively, and installed 4″ walnut flooring. 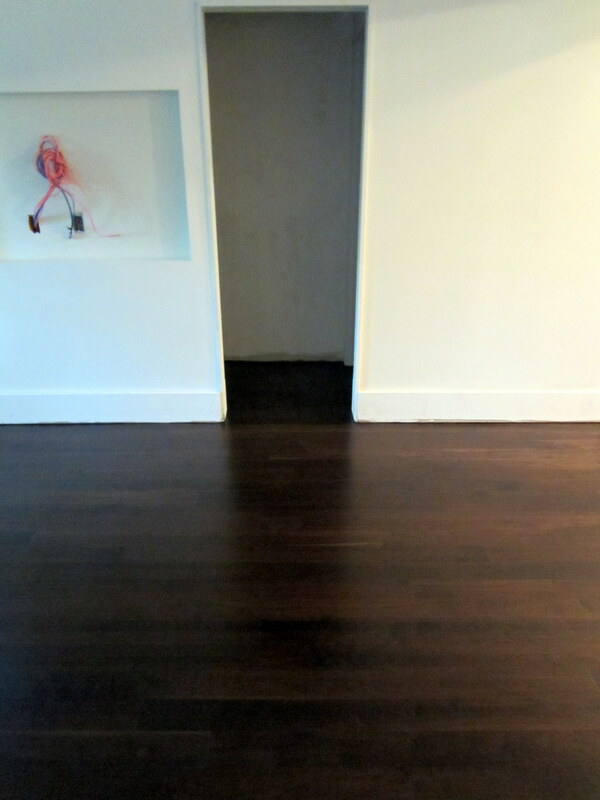 We liked the classic, gold-toned wood flooring in the original house, but wanted deep, dark wood floors in the new house. 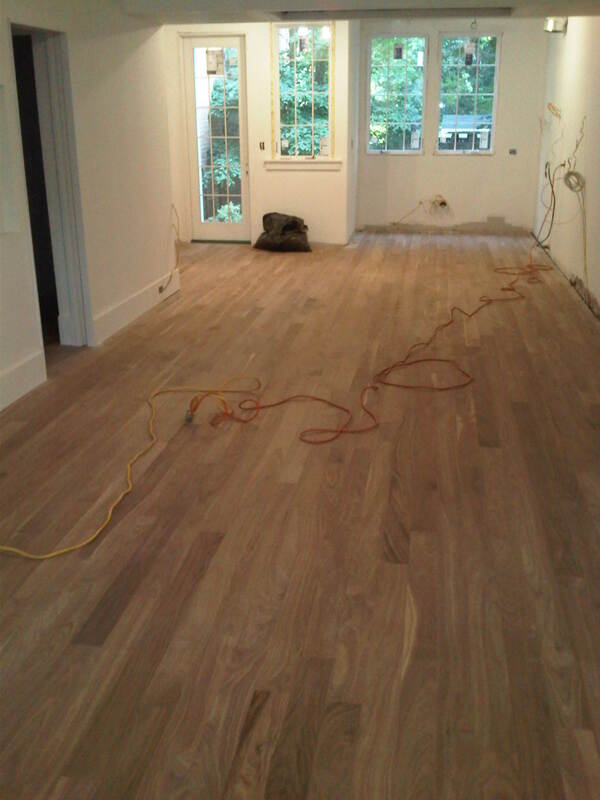 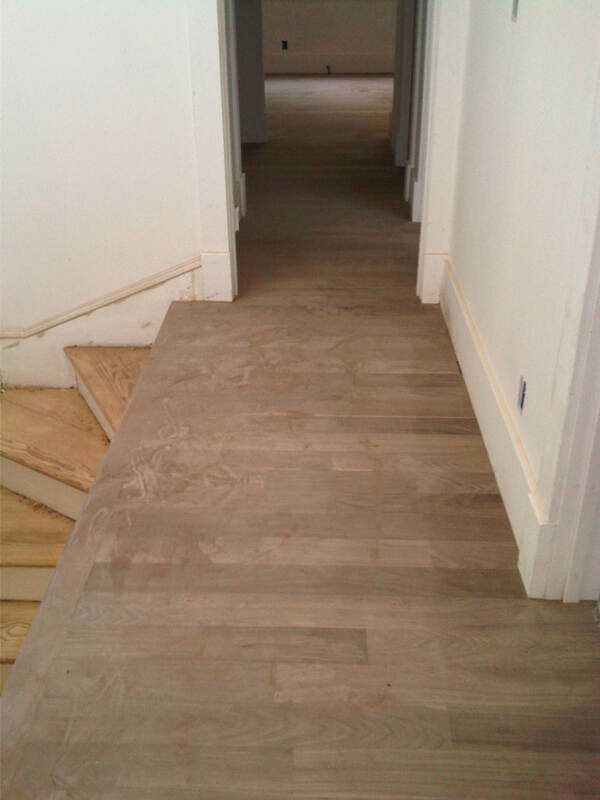 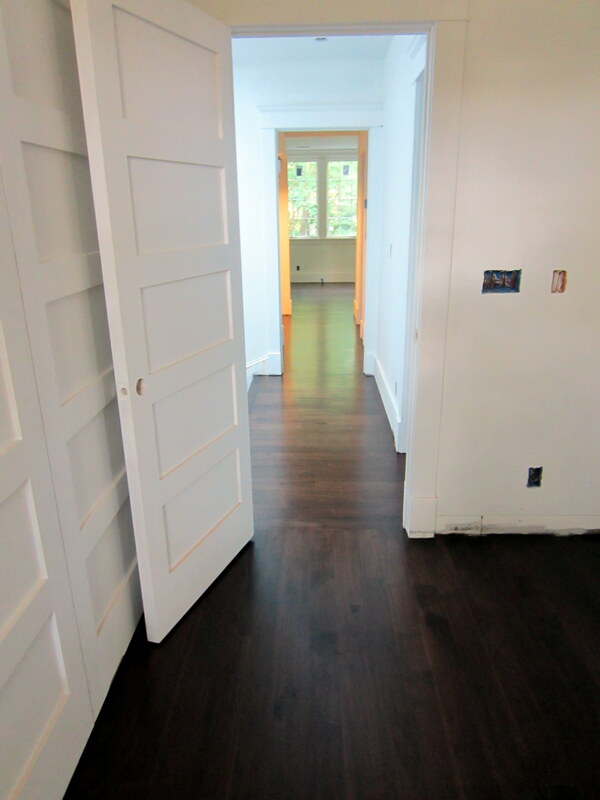 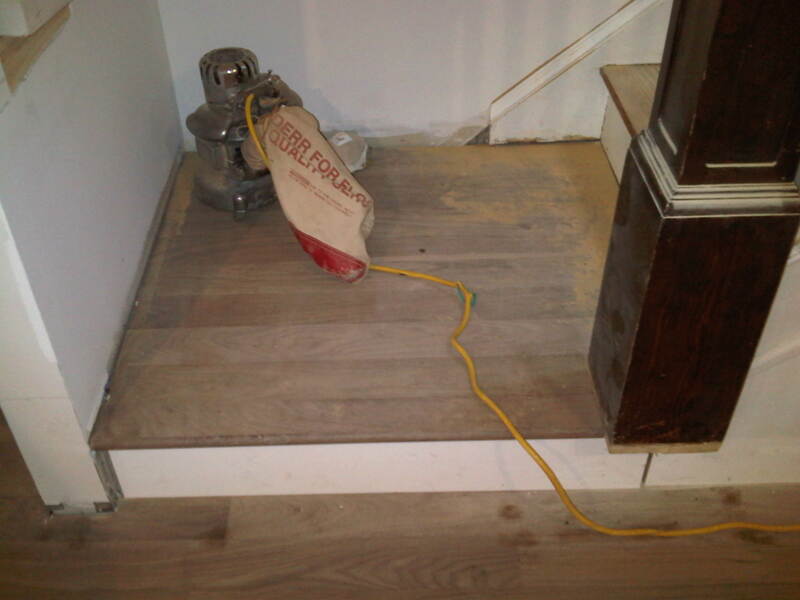 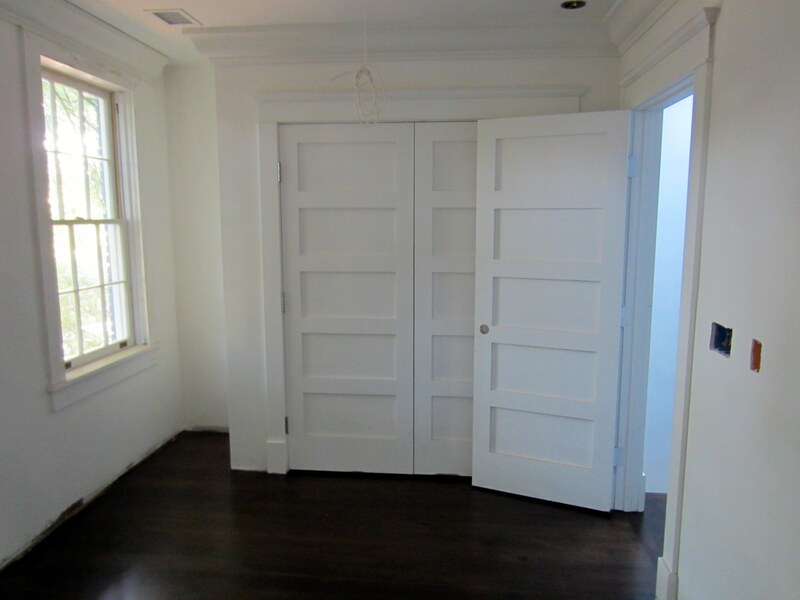 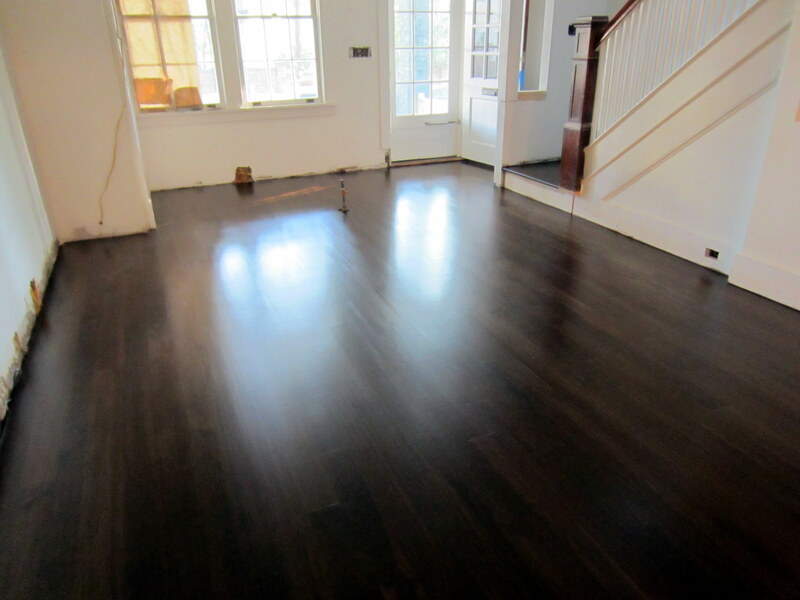 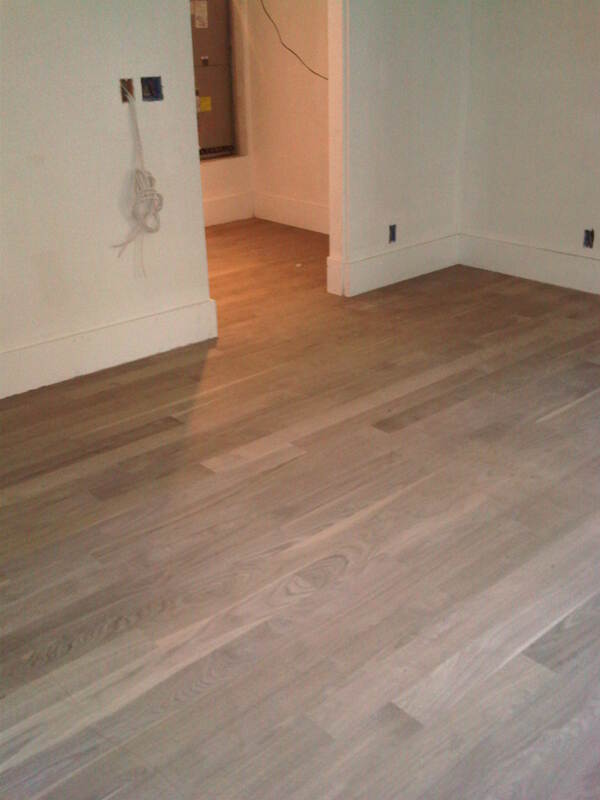 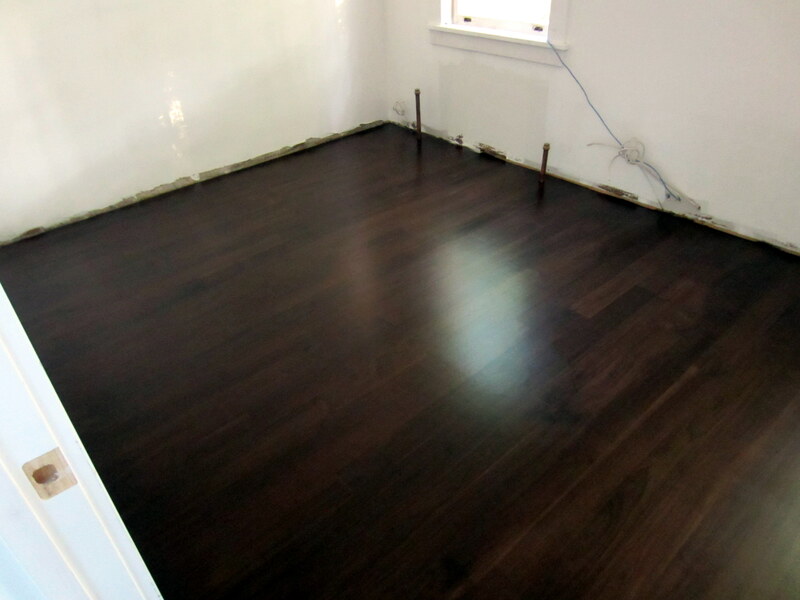 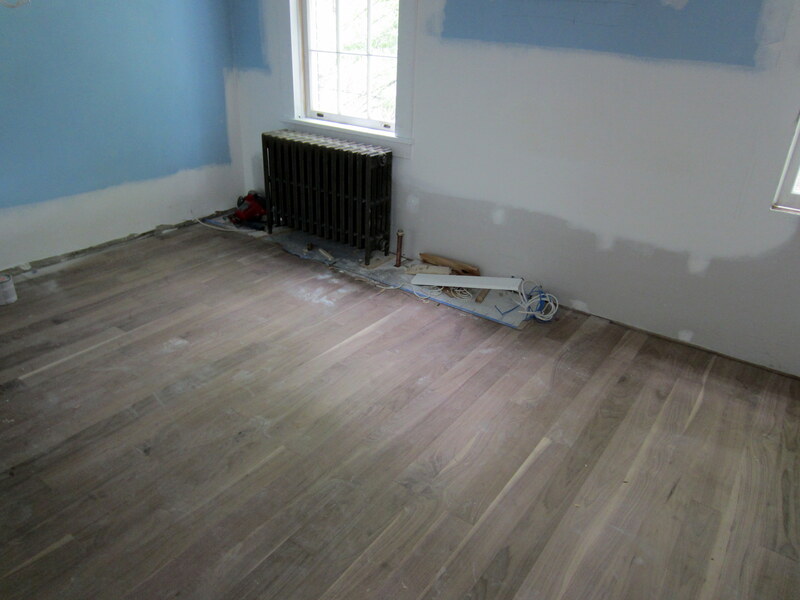 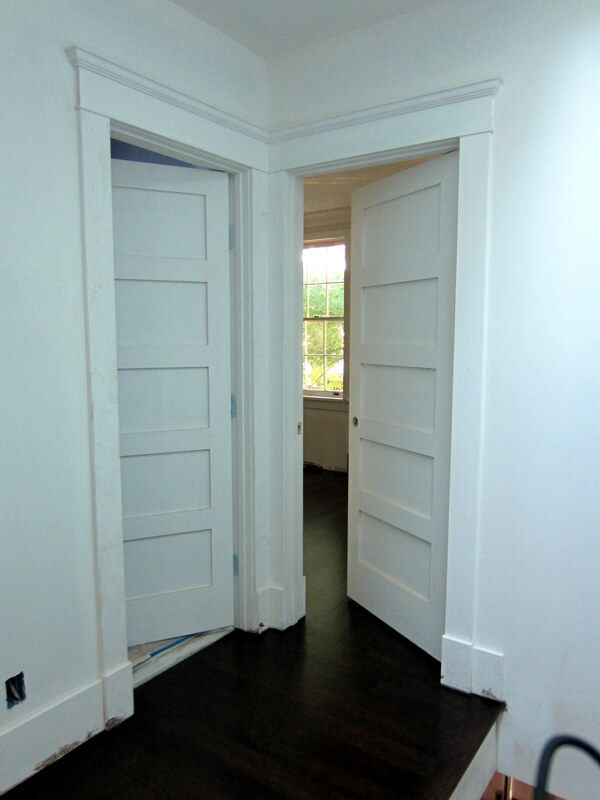 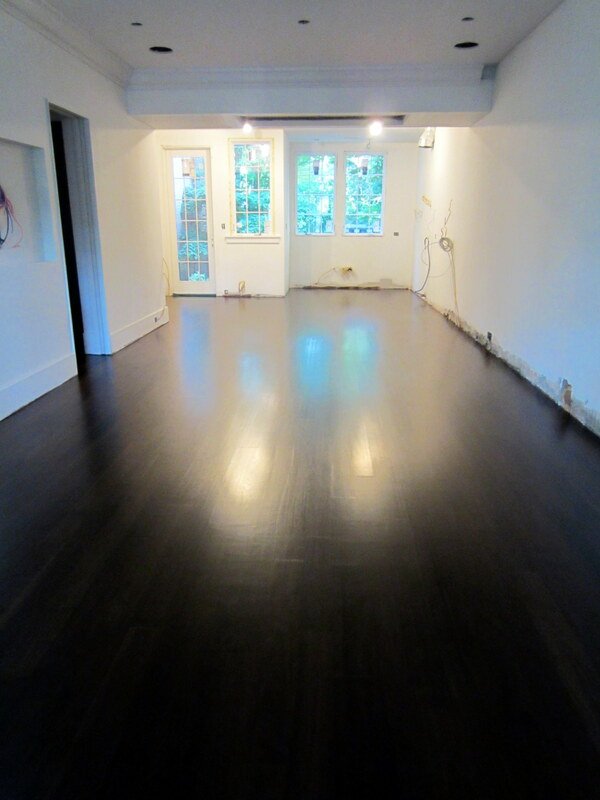 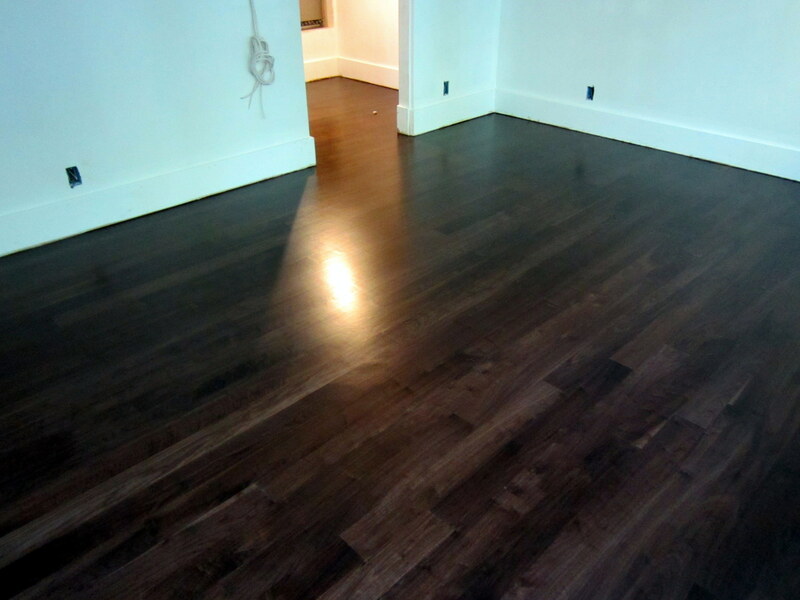 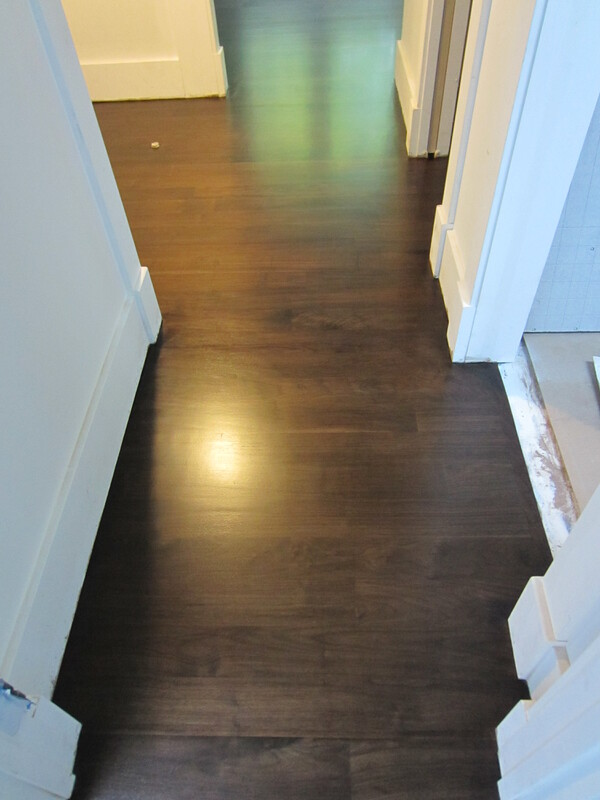 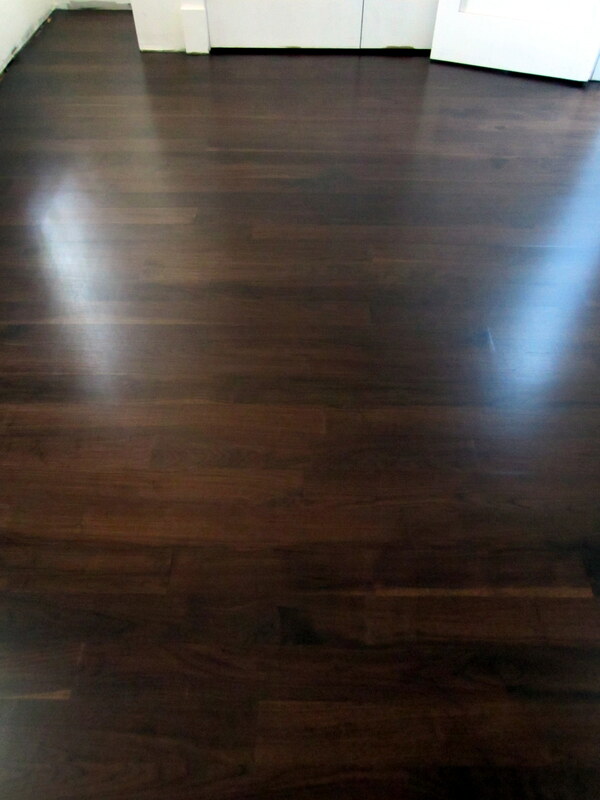 Presented below, with minimal commercial interruptions, are photos of the installed and sanded (but unfinished) wood floors, and then of the final product. 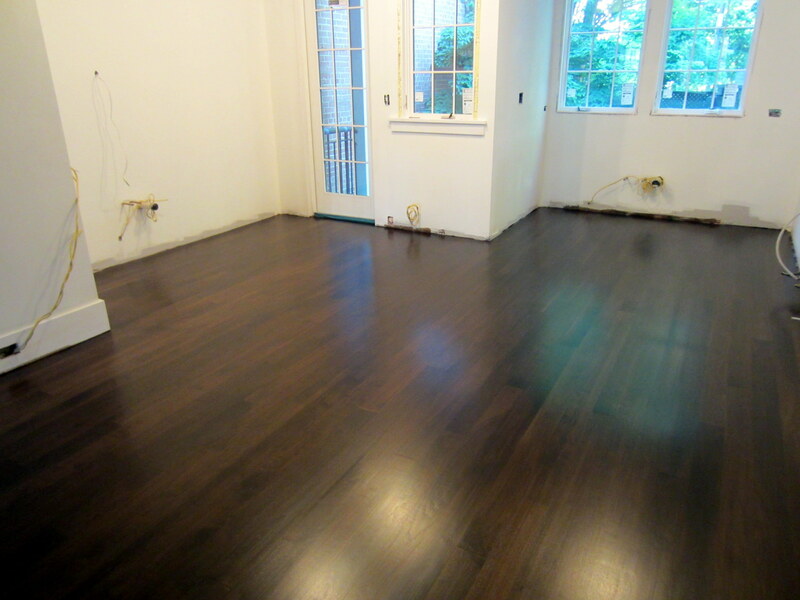 The staining and finishing work was just completed on June 22, and the result was exactly what we were hoping to achieve. 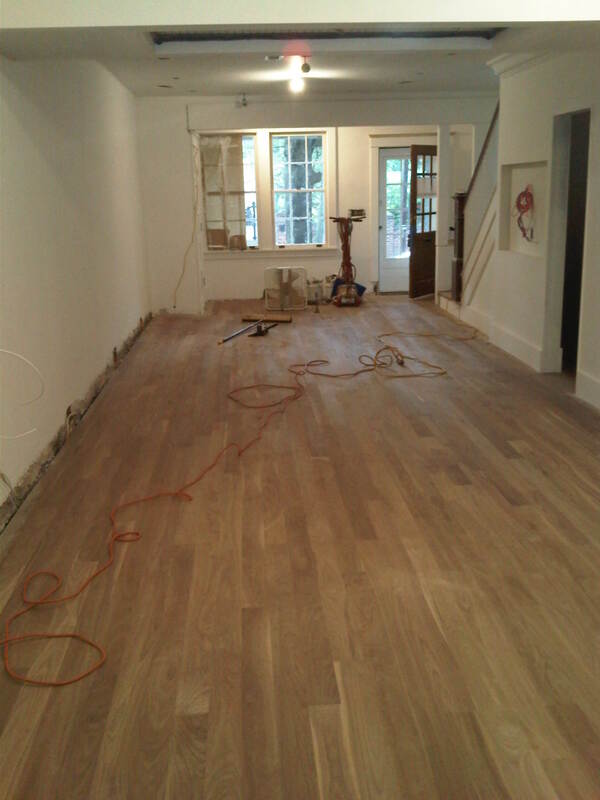 For this weekend, at least, we’re once again blissfully happy with how the WolfeStreetProject is coming along. 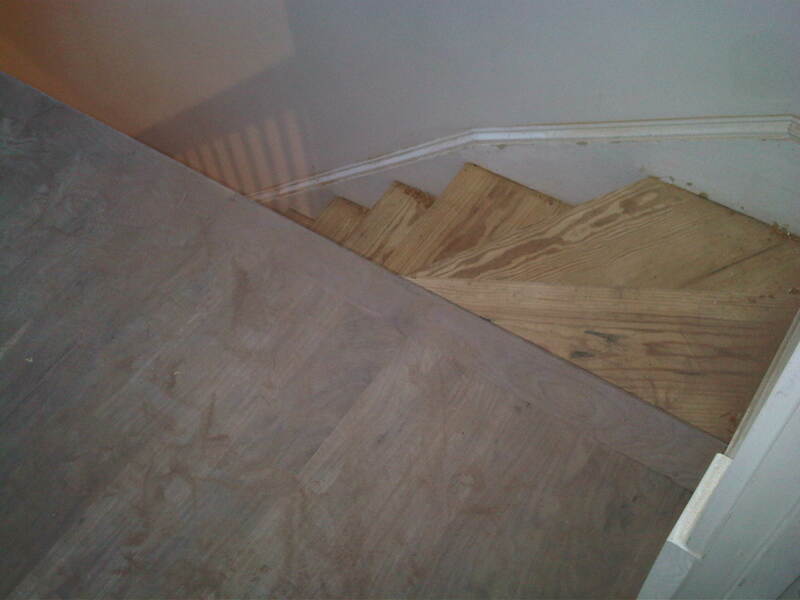 The only area where flooring was left intact was the stairs (the only original component remaining in the house). 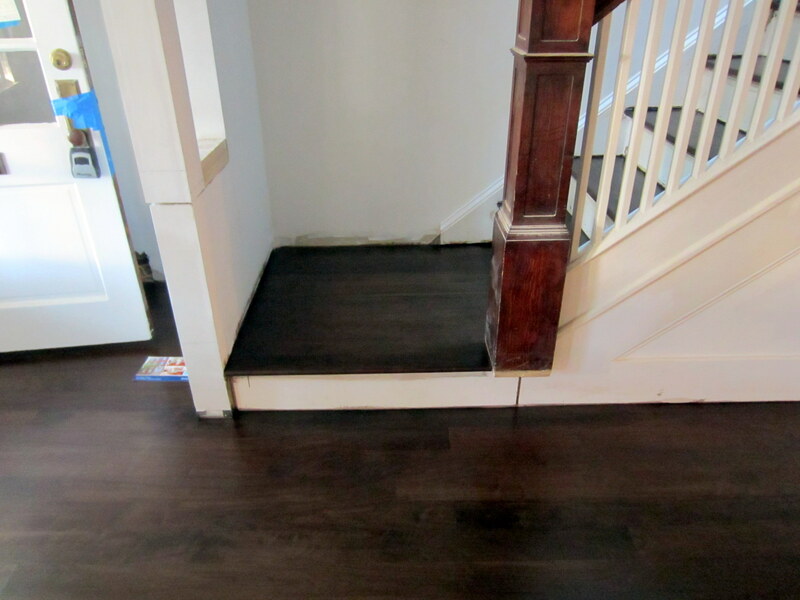 We considered adding walnut caps on the treads to blend them in with the new walnut flooring on the landing and upstairs hallway. 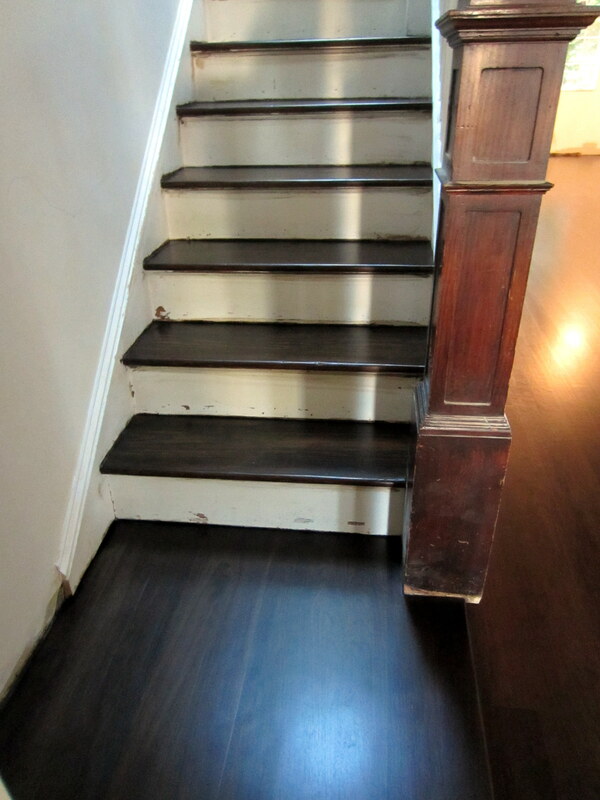 However, this would have screwed with the proportions, relative to the trim and risers at the top and bottom, and so we chose to sand and stain them, instead, with the hope of approximating the dark, stained walnut. 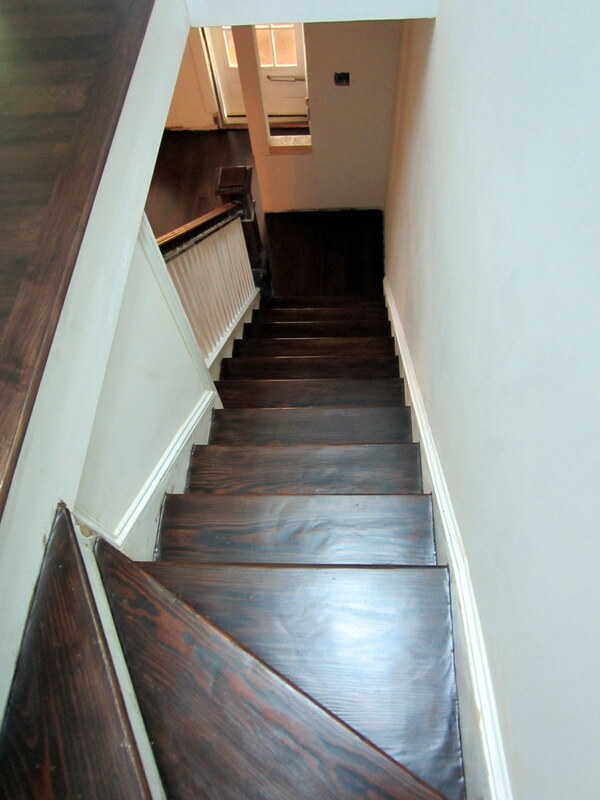 You can see the difference in the wood between the nosing on the second-floor hallway on the left and the pine stairs on the right, so the color-matching would not be an easy task. 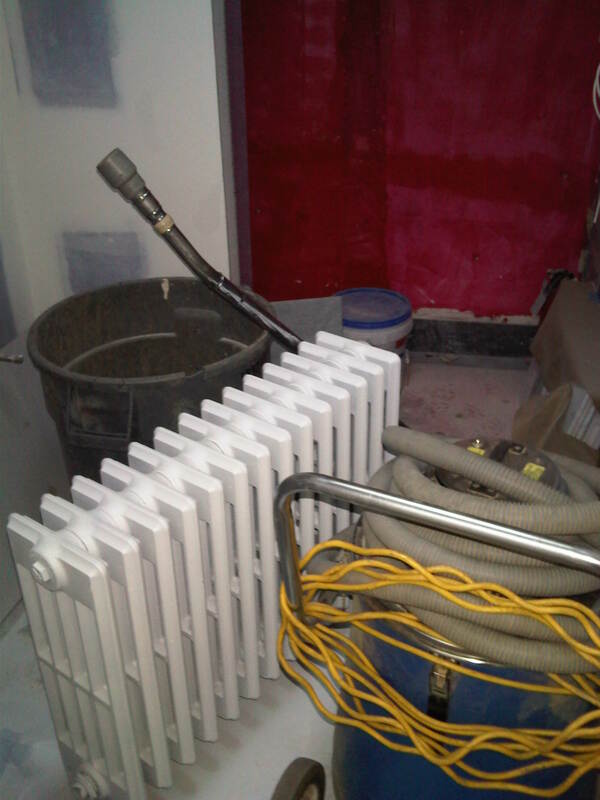 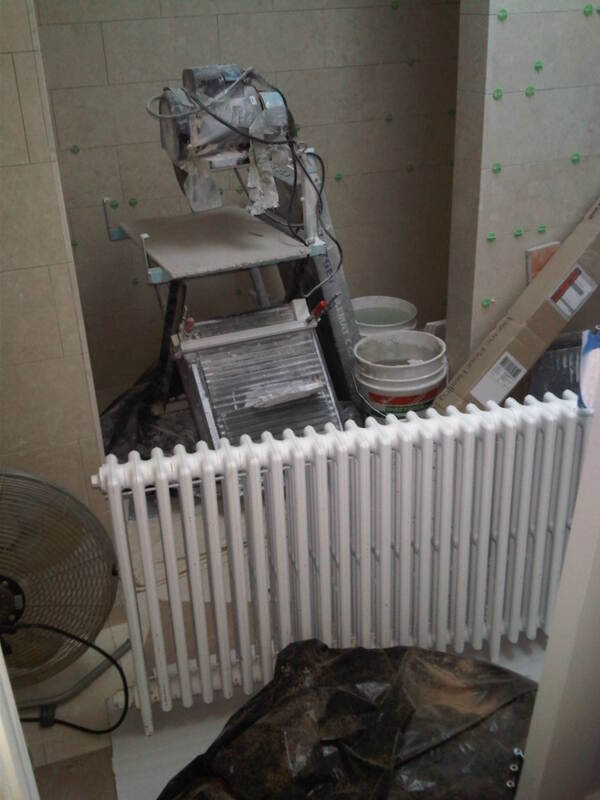 While the floor sub was working the entire week of June 18, all other work was halted, and the upstairs bathrooms became holding pens for the tile guys and the almost-painted radiators that are awaiting installation in the two bedrooms when the floors are complete. 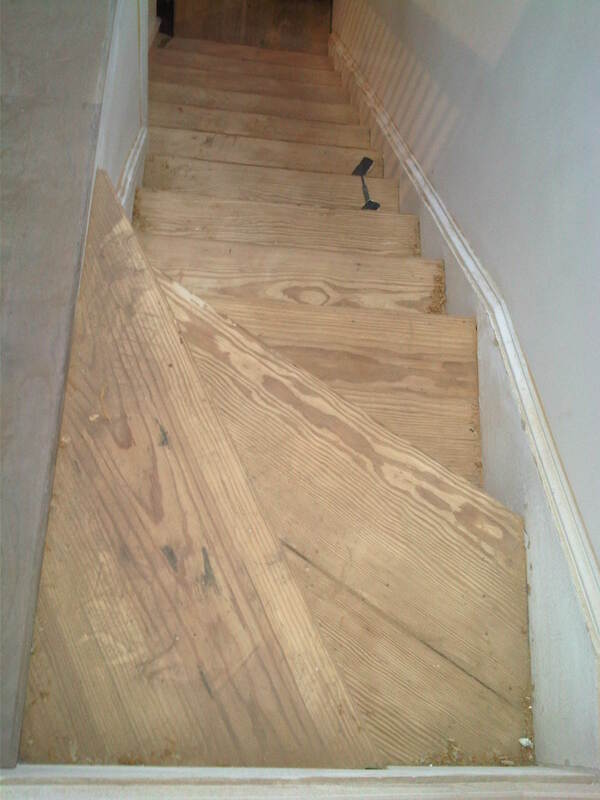 The stained treads turned out great (we’ll install a runner down the middle, regardless, so you’ll only be able to see the edges when everything is done). 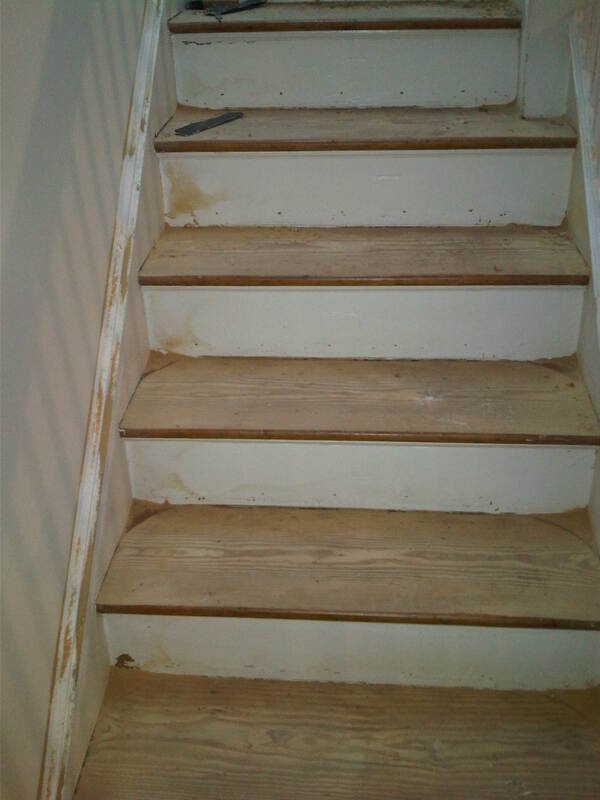 The newel post will be sanded during painting, and stained the same color.